The West Melton Kea Crossing on Weedons Ross road has been running successfully from Term 1 of this year. The volunteer road patrollers are out there in all weather keeping their school mates safe. Selwyn District Council School Road Safety Coordinator Stephanie Hautler asks drivers to keep their eyes peeled for children around West Melton and reminds them that the only time drivers must stop for pedestrians is on a pedestrian (zebra) crossing, at a school road patrol (a kea crossing) when the stop lollipops are out, and when pedestrians have a green man at traffic signals. 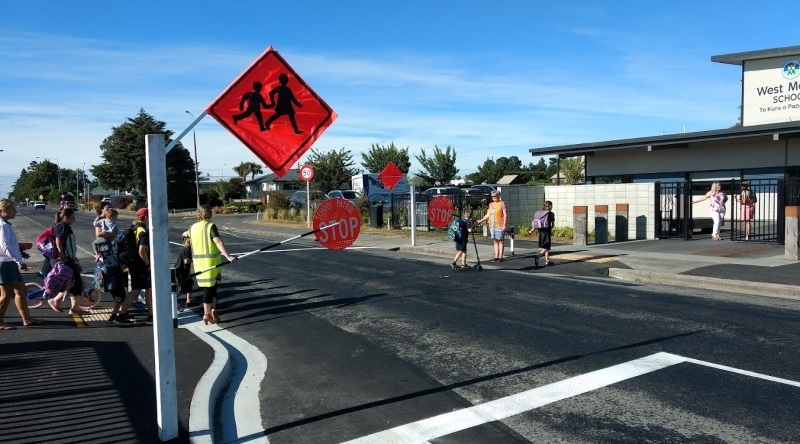 Although the kea crossing point on Weedons Ross Road may look like a pedestrian crossing with the kerb buildouts it is a normal section of road where drivers have right of way if the school road patrol is not operating. Pedestrians need to stop, look and listen before crossing the road at this cross point and just like any other section of road, vehicles have the right of way. “I often see drivers stopping to let children cross at cross points. Although drivers may think it’s courteous stopping in the lane, it’s incredibly dangerous and setting our children up for failure. Children may develop an expectation that all vehicles will stop for them,” says Mrs Hautler. “It is unsafe to stop in a live lane of traffic and you run the risk of being rear-ended or worse, being shunted into the very pedestrian you were trying to help”. Mrs Hautler says that if a vehicle stops on a crossing point, pedestrians should wave them on and wait for a gap in the traffic to cross safely. Be bright be seen on your way to school, ask your school for a safety vest. Tackle the routes with your child talking about sneaky driveways and blind corners. Get out and active together to reduce the chaos at the school gate. Wear your helmets, this goes for caregivers too, young people are watching you! Road safety educational resources for parents and children are available from Selwyn District Council. Email roadsafety@selwyn.govt.nz or phone 347 2705.